By its power to change the lives of those who read it, this unusual book has won a distinctive place in world literature. It is a small classic, designed to help us make the best use of the most priceless possession we have, time. The proverb that time is money understates the case. Time is the inexplicable raw material of everything. Without it nothing is possible. The supply of time is truly a daily miracle. You wake up in the morning, and lo! Your wallet is magically filled with 24 hours of the unmanufactured tissue of your life. It is yours. The most precious of possessions showered upon you in a manner as singular as the commodity itself! For remark! No one can take it from you. It is unstealable. And no one receives either more or less than you receive. Wealthy or genius is never rewarded by even an extra hour a day. And there is no punishment. Waste this precious commodity as you will, and yet the supply will never be withheld from you. You have to live in this 24 hours of daily time. Out of it you have to spin health, pleasure, money, content, respect and the evolution of your immortal soul. If one can’t contrive to live on a certain income of money, one earns a little more, or one braces the muscles and balances the budget. 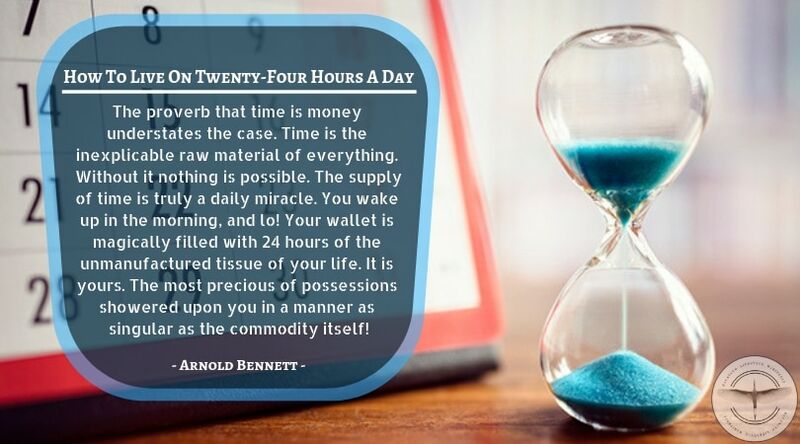 But if one cannot arrange that an income of 24 hours a day shall exactly cover all proper items of expenditure, one does muddle one’s whole life definitely. Which of us has not been saying to himself all his life: “I shall alter this or that when I have a little more time?” Which of us is not haunted by the feeling that the year slip by, and slip by, and that we have not yet been able to get our lives into proper working order? We have, and we have always had, all the time there is. It is the realization of this profound and neglected truth that has led me to the minute practical examination of daily time-expenditure. The most important preliminary to the task of arranging one’s life so that one may live fully and comfortably within the daily budget of 24 hours is the calm realization of the extreme difficulty of the task, of the sacrifices and the endless effort which it demands. I cannot too strongly insist on this. If you are not prepared for discouragements, if you will not be content with a small result for a big effort, then do not begin. Lie down again and resume the uneasy doze which you call your existence. It is very sad, is it not? And yet I think it is rather fine, too, this necessity for the tense bracing of the will before anything worth doing can be done. I feel it to be the chief thing that differentiates me from the cat by the fire. The chief beauty about the constant supply of time is that you cannot waste it in advance. The next day, the next hour are lying ready for you, as perfect, as unspoiled, as if you had never wasted a single moment in your career. Therefore no object is served in waiting till next week, or even till tomorrow. But before you begin, let me warn you against your own ardour. Ardour is a treacherous thing. You can’t satisfy it at first; it is eager to move mountains and divert the course of rivers. And then, too often, it wearies all of a sudden and dies. Beware of undertaking too much at the start. Allow for accidents. Allow for human nature, especially your own. A glorious failure leads to nothing; a petty success may lead to a success that is not petty. Therefore, in setting out on the immense enterprise of living fully within the narrow limits of 24 hours a day, let us avoid at any cost the risk of an early failure. Now let us examine the budget of the days’ time. You say your day is already full to overflowing. How? You actually spend in your earning your livelihood – how much? Seven hours, on the average? And in actual sleep, seven? I will add two hours, and be generous. And I will defy you to account to me on the spur of the moment for the other eight hours. To come to grips with the situation, I must choose a typical case – say a businessman who works in an office. Now the great mistake which my typical man makes in regard to his day is a mistake of general attitude which vitiates two third of his energies and interests. In the majority of instances he does not precisely feel a passion for his business. He begins his business functions with reluctance, as late as he can, and he ends them with joy, as early as he can. And his engines while he is engaged in his business are seldom at their full horsepower. Yet in spite of all this he persists in looking upon those hours from nine to five as “the day,” to which ten hours preceding and the six hours following are nothing but a prologue and epilogue. Such an attitude of course kills his interest in the odd 16 hours, with the result that, even if he does not waste them, he does not count them; he regards them simply as margin. If a man makes two thirds of his existence subservient to one third, for which he has no feverish zest, how can he hope to live fully and completely? He cannot. To live fully and completely he must arrange a day within a day. And this inner day, a Chinese box in a larger Chinese box, must begin at 5 p.m. and end at 9 a.m. During all these 16 hours he has nothing whatever to do but cultivate his body and his soul and his fellow men. During those 16 hours he is free; he is not a wage-earner; he is just as good as a man with a private income. This must be his attitude. And his attitude is all-important. His success in life depends on it. In examining the typical man’s method of employing the 16 hours that are entirely his, I will merely indicate things which he does which I think he ought not to do, postponing my suggestions for “planting” the times which I shall have cleared – as a settler clears spaces in a forest. In justice I must say that he wastes very little time before he leaves the house in the morning. In too many houses he gets up, breakfasts and then bolts. But immediately he bangs the front door his mental faculties, which are tireless, become idle. He walks to the station in a condition of mental coma. Arrived there, he usually has to wait for the train. At hundreds of suburban stations every morning you see men calmly strolling up and down platforms while railway companies unblushingly rob them of time, which is more than money. Hundreds of thousands of hours are thus lost every day because my typical man thinks so little of time it has never occurred to him to take quite easy precautions against the risk of its loss. He has a solid coin of time to spend every day. He must get change for it, and in getting change he is content to lose heavily. For that is what he does when the company robs him of five minutes twice a day… you say I am dealing with minutiae. I am. And later on I will justify myself. You get into the morning train and you calmly give yourself up to your newspaper. Your air is the air of a leisured man, wealthy in time, of a man from some planet where there are 124 hours a day instead of 24. I am an impassioned reader of newspapers. Hence it is not prejudice when I say that since they are produced with rapidity, to be read, with rapidity, there is no place in my daily programme for them. I read newspapers as I may in odd moments. As for devoting to them 30 or 40 consecutive minutes of wonderful solitude, I cannot possibly allow you to scatter priceless pearls of time with such oriental lavishness. You are not the Shah of time. Let me respectfully remind you that you have no more time than I have. No newspaper reading in trains! I have already “put by” about 30 minutes for use. Now you reach your office. And I abandon you there till five o’clock. I am aware that you have an hour in the midst of the day, less than half of which is given to eating. But I will leave you all that to spend as you choose. You may read your newspaper then. I meet you again as you emerge from your office. You are pale and tired. At any rate, your wife says you are pale, and you give her to understand that you are tired. You don’t eat immediately on your arrival home. But in about an hour or so feel as if you could sit up, and take a little nourishment. After dinner you smoke, seriously; you see friends; you putter; you play cards; you flirt with a book; you take a stroll; you caress the piano… By Jove! A quarter past ten. Time to think about going to bed! You then devote quite 40 minutes to thinking about it, and at last you go to bed, exhausted by the day’s work. Six hours have gone since you left the office – gone like a dream, gone like magic, unaccountably gone! That is a fair sample case. But you say: “It’s all very well for you to talk. A man is tired. A man must see his friends. He can’t always be on the stretch.” Just so. But when you arrange to go to the theatre (especially with a pretty woman) what happens? You spare no toil to make yourself glorious in fine raiment; you rush back to town; you keep yourself on the stretch for four hours, if not five; you take her home; you take yourself home. You don’t spend three quarters of an hour in “thinking about” going to bed. You go. Friends and fatigue have equally been forgotten, and the evening has seemed exquisitely long (or perhaps too short!). And do you remember that time when you were persuaded to sing in the chorus of the amateur operatic society, and slaved two hours every other night for three months? Can you deny that when you have something definite to look forward to at eventide, something that is to employ all your energy – the thought of that something gives a glow and a more intense vitality to the whole day? What I suggest is that at five o’clock you look facts in the face and admit that you are not tired (because you are not, you know), and that you arrange your evening so that it is not cut in the middle by a meal. By so doing you will have a clear expanse of at least three hours. I do not suggest that you should employ three hours every night of your life in using up your mental energy. But I do suggest that you might, for a commencement, employ an hour and a half every other evening in some important and consecutive cultivation of the mind. You will still be left with three evenings for friends, bridge, domestic scenes, odd reading, pipes, gardening and pottering. If you preserve you will soon want to pass four evenings, and perhaps five, in some sustained endeavour to be genuinely alive. And you will fall out of that habit of muttering to yourself at 10:15 p.m., “Time to be thinking about going to bed.” The man who begins to go to bed 40 minutes before he opens his bedroom door is bored; that is to say, he is not living. But remember, at the start, those 90 nocturnal minutes thrice a week must be the most important minutes in the entire 10,080. They must be sacred, quite as sacred as a dramatic rehearsal or a tennis match. Instead of saying, “Sorry, but I have to run off to a bridge game,” you must say, “… but I have to work.” This, I admit, is intensely difficult. Bridge is so much more urgent than the immortal soul. In the average case I should say: Confine your formal programme to six days a week. If you find yourself wishing to extend it, extend it; but count the time extra as a windfall, not as regular income, so that you can return to a six-day programme without the sensation of being poorer, of being a backslider. Let us now see where we stand. So far we have marked for saving out of the waste of days half an hour at least six mornings a week, and one hour and a half on three evenings a week. Total, seven hours and a half a week. “What?” you cry. “You pretend to show us how to live, and you only deal with seven hours and a half out of 168! Are you going to perform a miracle with your seven hours and a half?” well, not to mince the matter, I am – if you will kindly let me! My contention is that the full use of those hours will quicken the whole life of the week, add zest to it, and increase the interest which you feel in even the most banal occupation. It is not really a trifling effort to “clear” even seven hours and a half from the jungle. One may have spent one’s time badly, but one did spend it. To do something else means a change of habits. And habits are the very dickens to change. Some sacrifice, and an immense deal of volition, will be necessary. Hence I iterate and reiterate: Start quietly, unostentatiously. Before coming to the method of using the indicated hours, I have one final suggestion to make. That is, to allow much more than an hour and a half in which to do the work of an hour and a half. Remember the chance of accidents. Remember human nature. And give yourself, say from 9 to 11 for your task of 90 minutes. People say: “one can’t help one’s thoughts.” But one can. The control of the thinking machine is perfectly possible. And since nothing whatever happens to us outside our own brain, the supreme importance of being able to control what goes on in that mysterious brain is patent. For without the power to concentrate – that is to say, without the power to dictate to the brain its task and to insure obedience – true life is impossible. Mind control is the first element of a full existence. Hence, it seems to me, the first business of the day should be to put the mind through its paces. It is for this portion of the art and craft of living that I have reserved the time from the moment of quitting your door to the moment of arriving at your office. “What? I am to cultivate my mind in the street, on the platform, in the train?” Precisely. Nothing simpler! No tools required! Not even a book. Nevertheless, the affair is not easy. When you leave your house, concentrate your mind on a subject (no matter what, to begin with). You will not have gone ten yards before your mind has skipped away under your eyes and is larking round the corner with another subject. Bring it back by the scruff of the neck. Ere you have reached the station you will have brought it back about 40 times. Do not despair. You cannot by any chance fail if you persevere. It is idle to pretend that your mind is incapable of concentration. Do you not remember that morning when you received a disquieting letter which demanded very carefully worded answer? How you kept your mind steadily on the subject of the answer until you reached the office: whereupon you instantly sat down and wrote the answer? That was a case in which you were roused by circumstances to such a degree of vitality that you were able to dominate your mind like a tyrant. You insisted that its work should be done, and its work was done. By the regular practice of concentration (as to which there is no secret – save perseverance) you can tyrannize over your mind every hour of the day, and in no matter what place. It is for you, I passionately repeat. Indeed, you are the very man I am aiming at. Throw away the suggestion, and you throw away the most precious suggestion that was ever offered to you. Try it. Get your mind in hand. And see how the process cures half the evils in life – especially worry, that miserable, avoidable, shameful disease: worry! The exercise of concentrating the mind is a mere preliminary, like scales on the piano. Having acquired power over that most unruly member, one has naturally to put it to the yoke. A course of primary study is indicated. Now as to what this course of study should be there cannot be any question. It is the study of one’s self. Man, know thyself. These words are so hackneyed that I blush to write them, yet only the most sagacious put them into practice. I don’t know why. I am convinced that what is more than anything else lacking in the life of the average well-intentioned man of today is the reflective mood. We do not reflect. I mean we do not reflect upon genuinely important things; upon the problem of our happiness, upon the main direction in which we are going, upon what life is giving to us, upon the share which reason has (or has not) in determining our actions, and upon the relation between our principles and our conduct. For happiness does not spring from physical or mental pleasure, but from the development of reason and the adjustment of conduct to principles. Do not fear that I mean to thrust certain principles upon your attention. All I urge is that a life in which conduct does not fairly well accord with principles is a silly life; and that conduct can only be made to accord with principles by means of daily examination, reflection and resolution. The less we reflect, the less reasonable we shall be. The next time you get cross with the waiter because your steak is over-cooked, ask reason to step into the cabinet-room of your mind, and consult her. She will probably tell you that the waiter did not cook the steak, and had no control over the cooking; and that even if he alone was to blame, you accomplished nothing by getting cross; you merely lost your dignity, looked a fool and soured the waiter, while producing no effect whatever on the steak. The result of this consultation with reason (for which she makes no charge) will be that when once more your steak is overcooked you will treat the waiter as a fellow creature, remain quite calm and politely insist on having a fresh steak. The gain will be obvious and solid. In the formation of principles, and the practice of conduct, much help can be derived from books. I suggest Marcus Aurelius and Epictetus. I may also mention Pascal, La Bruyere and Emerson. But no reading of books will take the place of a daily, candid, honest examination of what one has recently done, and what one is about to do – of a steady looking at one’s self in the face (disconcerting though the sight may be). When shall this important business be accomplished? The solitude of the evening journey home appears to me to be suitable for it. A reflective mood naturally follows the exertion of having earned the day’s living. Of course, if, instead of attending to an elementary and profoundly important duty, you prefer to read the paper (which you might just as well read while waiting for your dinner) I have nothing to say. But attend to it at some time of the day you must. I now come to the evening hours. Many people remain idle in the evenings because they think there is no alternative t idleness but the study of literature; and they do not happen to have a taste for literature. This is a great mistake. There are enormous fields of knowledge quite outside literature which yield magnificent results to cultivators. For example, you go to concerts and you enjoy the music. But you say you cannot play the piano or the fiddle. What does that matter? Surely your inability to perform “The Maiden’s Prayer” on a piano need not prevent you from making yourself familiar with the construction of the orchestra to which you listen. As things are, you probably think of the orchestra as a heterogeneous mass of instruments producing a confused agreeable mass of sound. You do not listen for details because you have never trained your ears to listen to details. If you were asked to name the instruments which play the great theme at the beginning of Beethoven’s C Minor Symphony – which has thrilled you – you could not name them for your life’s sake. All that you can positively state about the C Minor Symphony is that it is a “fine thing.” Now, if you have read one of many books on “how to listen to music,” you would go to the next concert with an astonishing intensification of interest in it. Instead of a confused mass, the orchestra would appear to you as what it is – a marvellously balanced organism whose various groups of member each have a different and an indispensable function. You would spy out the instruments, and listen for them. You would know the gulf that separates a French horn from an English horn. You would live at a concert whereas previously you had merely existed there in a state of beatific coma, like a baby gazing at a bright object. What applies to music applies to the other arts. I might mention books on “how to look at pictures,” or “how to judge architecture,” as beginnings (merely beginnings) of a systematic vitalizing knowledge in other arts. “I hate all the arts!” you say. My dear sir, I respect you more and more. I will deal with your case next, before coming to literature. Art is a great thing. But it is not the greatest. The most important of all perceptions is the continual perception of cause and effect – of the continuous development of the universe. It is hard to have one’s watch stolen, but one reflects that the thief became a thief from causes of heredity and environment which are as interesting as they are scientifically comprehensible; and one buys another watch, if not with joy, at any rate with a philosophy that makes bitterness impossible. One loses, in the study of cause and effect, that absurd air which so many people have of being always shocked by the curiousness of life. Such people live amid human nature as if human nature were a foreign country. But, having reached maturity, one ought surely to be ashamed of being stranger in a strange land. The study of cause and effect, while it lessens the painfulness of life, adds to its picturesqueness. The man to whom evolution is but a name looks at the sea as a grandiose, monotonous spectacle. The man who is imbued with the idea of continuous cause and effect perceives in the sea an element which in the day-before-yesterday of geology was vapour, which yesterday was boiling, and which tomorrow will inevitably be ice. Nothing will afford a more durable satisfaction than the constantly cultivated appreciation of this tremendous, changeful picturesqueness of life. Perhaps you happen to be an estate agent’s clerk, and you hate the arts, and you want to foster your immortal soul, and you can’t be interested in your business because it’s so humdrum. Nothing is humdrum. The tremendous, changeful picturesqueness of life is marvellously shown in an estate agent’s office. There was a congestion of traffic in Oxford Street; to avoid the congestion people actually began to travel under the cellars and drains, and the result was a rise of rents in Shepherd’s Bush! And you say that isn’t picturesque! Suppose you were to study, in this spirit, the property question for an hour and a half every other evening. Would it not give zest to your business, and transform your whole life. You are a bank clerk, and you have not read that breathless romance (disguised as a scientific study), Walter Bagehot’s Lombard Street? Ah, my dear sir, if you had begun with that, and followed it up for 90 minutes every other evening, how enthralling your business would be to you, and how much more clearly you would understand human nature. You are “penned in town,” but you love excursions to the country and the observation of wild life – certainly a heart-enlarging diversion. Why don’t you walk out of your house door to the nearest street lamp of a night with a butterfly net, and observe the wild life of common and are moths beating about it, and coordinate the knowledge thus obtained and build a superstructure on it, and at last get to know something about something? You need not be devoted to the arts, not to literature, in order to live fully. Th whole field of daily habit and scene is waiting to satisfy that curiosity which means life, and the satisfaction of which means an understanding heart. Novels are excluded from the “serious reading” of 90 minutes three times a week – for the reason that bad novels ought not to be read, and that good novels never demand any appreciable mental application on the part of the reader. A good novel rushes you forward like a skiff down a stream, and you arrive at the end, perhaps breathless, but unexhausted. The best novels involve the least strain. Now in the cultivation of the mind one of the most important factors is precisely the feeling of strain, of difficulty, of a task which one part of you is anxious to achieve and another part of you is anxious to shirk; and that feeling cannot be got in facing a novel. Imaginative poetry produces probably the severest strain of any form of literature. It is the highest form of literature. I say this with the sad consciousness of the fact that the majority of people do not read poetry. If poetry is what is called “a sealed book” to you, begin by reading Hazlitt’s famous essay on the nature of “poetry in general.” It is difficult to imagine the mental state of the man who, after reading this essay, is not urgently desirous of reading some poetry before his next meal. If you are antagonistic to poetry, then there is history or philosophy. Herbert Spencer’s First Principles, for instance, simply laughs at the claims of poetry and refuses to be accepted as aught but the most majestic product of any human mind. I do not suggest it as a work suitable for a tyro in mental strains. But I see no reason why any man of average intelligence should not, after a year of continuous reading, be fit to assault the supreme masterpieces of history or philosophy. The great convenience of masterpieces is that they are so astonishingly lucid. I offer two general suggestions for self-improvement through reading. The first is to define the direction and scope of your efforts. Choose a limited period, or a limited subject, or a single author. Say to yourself: “I will know something about the French Revolution, or the rise of railways, or the works on John Keats.” And during a given period confine yourself to your choice. There is much pleasure to be derived from being a specialist. The second suggestion is to think as well as to read. I know people who read and read, and for all the good it does them they might just as well cut bread-and-butter. They fly through the shires of literature on a motorcar, their sole object being motion. They boast of how many books they have read in a year. Unless you give 45 minutes of careful, fatiguing reflection (it is an awful bore at first) upon what you are reading, your 90 minutes of a night are chiefly wasted. This means that your pace will be slow. Never mind. Forget the goal; think only of surrounding country; and after a period, perhaps when you least expect it, you will suddenly find yourself in a lovely own on a hill. I cannot terminate these hints upon the full use of one’s time to the great end of living (as distinguished from vegetating) without referring to certain dangers which lie in wait for the sincere aspirant towards life. The first is the danger of becoming that most odious of persons – a prig. A prig is a pompous fool who has gone out for a ceremonial walk, and without knowing it has lost an important part of his attire, namely, his sense of humour. A prig is a tedious individual who, having made a discovery, is so impressed that he is capable of being gravely displeased because the entire world is not also impressed by it. Hence, when one sets forth on the enterprise of using all one’s time, it is just as well to remember that it is one’s own time, and not other people’s time, with which one has to deal; that the earth rolled on pretty comfortably before one began to balance a budget of the hours. Another danger is of being tied to a programme like a slave to a chariot. I know men whose lives are a burden to themselves and to their relatives and friends simply because they have failed to appreciate the obvious fact that while a programme must be respected it must not be worshiped as fetish. “Oh no,” I have heard a martyred wife exclaim, “Arthur always takes a dog out for exercise at eight o’clock and he always begins to read at a quarter to nine. So it’s quite out of the question that we should…” etc., etc. And the note of absolute finality in that plaintive voice reveals the unsuspected tragedy of a career. On the other hand, a programme is a programme. And unless it is treated with deference it ceases to be anything but a poor joke. There is still another danger of developing a policy of rush, of being gradually more obsessed by what one has to do next. The only cure is to reconstitute one’s programme, and to attempt less. But an excellent palliative is to pass with exaggerated deliberation from one portion of the programme to another; in other words, to waste five minutes with the consciousness of wasting them. The last, and the chief danger is one to which I have already referred – the risk of failure at the start. This may easily kill outright the newborn impulse towards a complete vitality, and therefore every precaution should be observed to avoid it. The impulse must not be overtaxed. Let the pace of the first lap be even absurdly slow, but let it be as regular as possible. And, having once decided to achieve a certain task, achieve it at all costs of tedium and distaste. The gain in self-confidence of having accomplished a tiresome labour is immense. Finally, in choosing the first occupations of those evening hours, be guided by nothing whatever but your taste and natural inclination. It is a fine thing to be a walking encyclopaedia of philosophy, but if you happen to have no liking for philosophy, and to have a liking for the natural history of street-cries, much better leave philosophy alone, and take to street-cries.